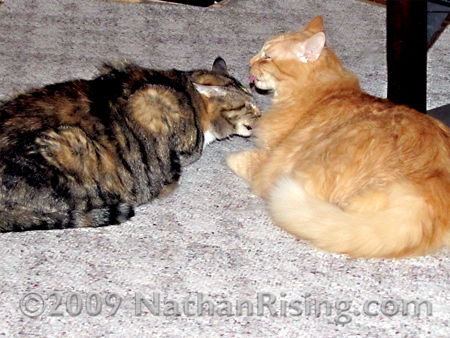 Andrew and Kayli, caught in a rare instance of showing each other affection. I swear, sometimes I think that our cats believe they are human. We have Andrew, the orange Tabby who “talks” to me constantly, follows me around like he’s my shadow, and even sits like a human, his fat creating this kind of … halo… around his body. 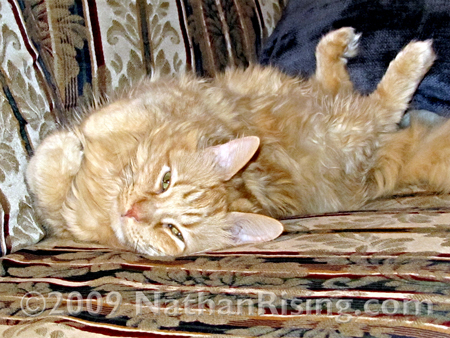 And when he’s not sitting like a human, he’s doing these strange contortionist poses with his body. Remember Gumby? That’s what Andrew reminds me of with his little bendable legs going every which direction. Then we have Meeper, who apparently doesn’t like his paws to be cold and will actually put his paws under our space heater. Like it’s his personal PAW-WARMER. 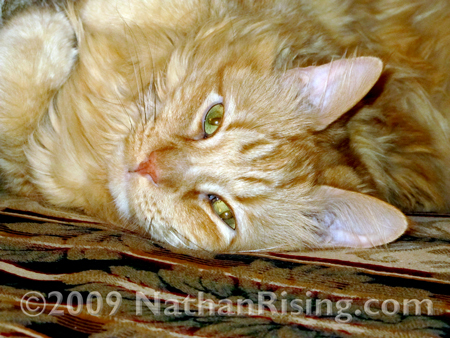 This entry was posted by Jen on January 6, 2010 at 9:52 pm, and is filed under Pets. Follow any responses to this post through RSS 2.0.You can skip to the end and leave a response. Pinging is currently not allowed. 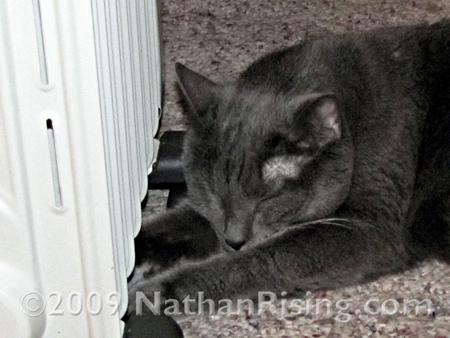 Our cat Piper does just like Meeper,with her paws under the heater.She looks like those Egyptian statues,with their unique poses,as she lays around the house/by the heater. Your cats are all beautiful.You know something that I have noticed? Look at your cat’s fur,how smooth and shiny it is.When you get a chance,look at the cats that live outside.Their fur doesn’t look the same.It’s not shiny,its rough and spiky.The main thing that i don’t see in cats that are outside,is LOVE.I truly think LOVE changes their physical appearance.Take note,when you see them and see if you think I’m right. I think you are right… a lot of it DOES have to do with being loved. A pet that is loved is happier and I think it shows not only in how they act, but how they look as well.